After Angie's attempt at a hot Cocoa popcorn left me cold, I decided to try Chips Ahoy's take on the classic winter beverage, because I'm a glutton for punishment and never learn from my past mistakes. In all seriousness, back when I guested on the Nosh show we discussed these cookies in their Nosh or Not segment, and I called them out on being a normal chocolate cookie hiding under a fancy seasonal name. It must just be a chocolate cookie with chocolate and white chocolate chips, right? Just a marketing ploy? Oh how wrong I was. I opened up the package and the cookies look pretty normal. 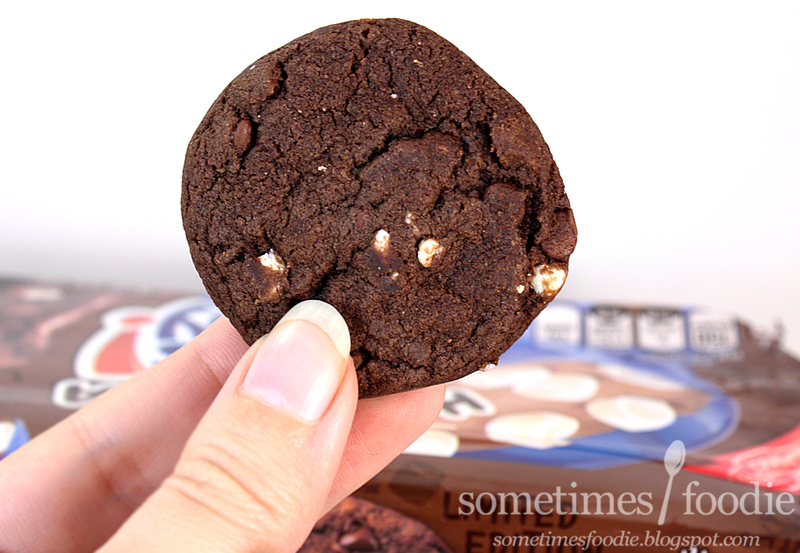 We have a dark, soft, chocolate flavored cookie with some chocolate chips and white chocolate chunks. Nothing out o the ordinary there. Unlike Angie's popcorn-y attempt at cocoa, these cookies smell great! This smells like cocoa powder, sugar, milk and vanilla. It's a bit on the processed side of things, but it's a grocery store cookie, so that's to be expected. With this cookie in particular, there are two ways to eat it. 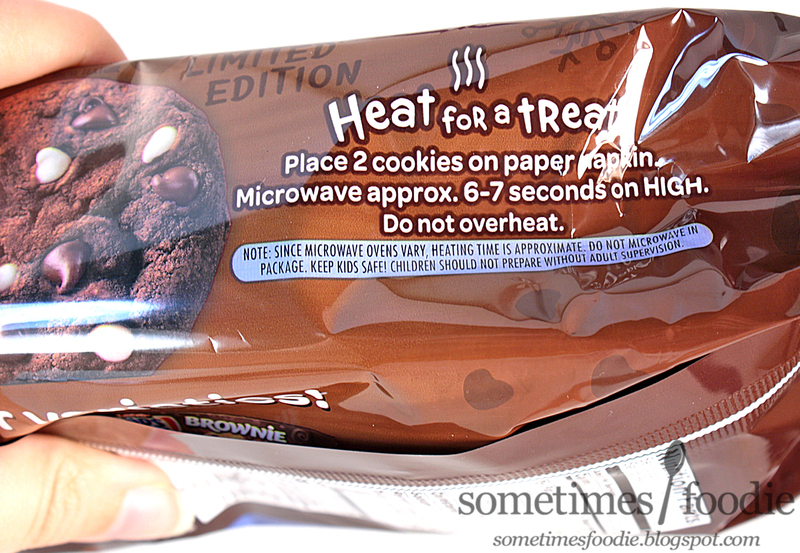 The first way is right out of the package as-is, the other is to warm it up in the microwave for a few seconds to get the full cocoa effect. To start, I grabbed one right out of the package and took a bite. I normally hate all grocery store cookies, and prefer homemade (what can I say? I'm a cookie snob), but this? This is pretty darn good! The chewy cookie has some great chocolate flavoring, the chips add a touch of marshmallow-like vanilla, and the added chocolate filling and chips crank the chocolate-y aspect up to 10! 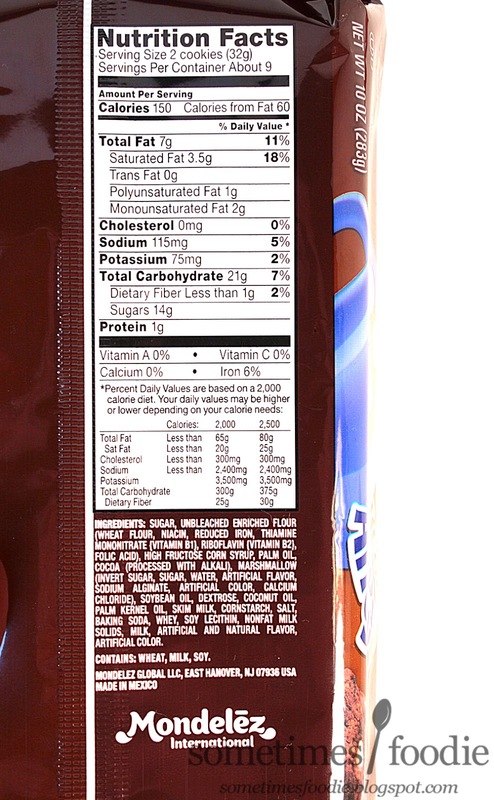 Seriously, this might be one of the best Chips Ahoy cookies I've ever had. The real question is, does this taste like hot cocoa? Not really. It's really chocolate-y, with a hint of vanilla, but I'm not getting the bold marshmallow-y flavoring I always associate with cocoa. Maybe if I warmed it up? 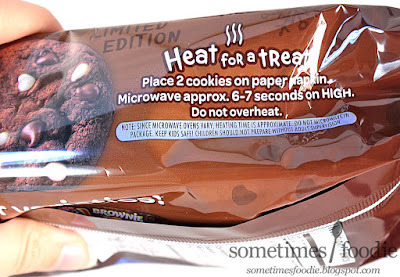 The heating instructions are easy enough, but will 6 seconds in the microwave really make a difference? I was skeptical, but I gave it a try anyway. Holy crap. I am eating my words and they're delicious! How is this possible? I take back half of all the bad things I have ever said about grocery store cookies and Chips Ahoy. This is seriously good! The overall cookies and mixed in chips taste the same post microwaving, but the filling completely changes in texture and reminds me of roasted marshmallow fluff mixed with instant cocoa powder. It's amazing and addicting, especially when it's paired with an ice cold glass of milk. 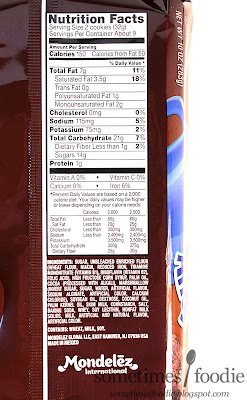 That's it, I'm declaring this the best non-cocoa cocoa-themed product of 2015. The heating up aspect isn't a gimmick at all! The cookies really do shine after a few seconds in the microwave. 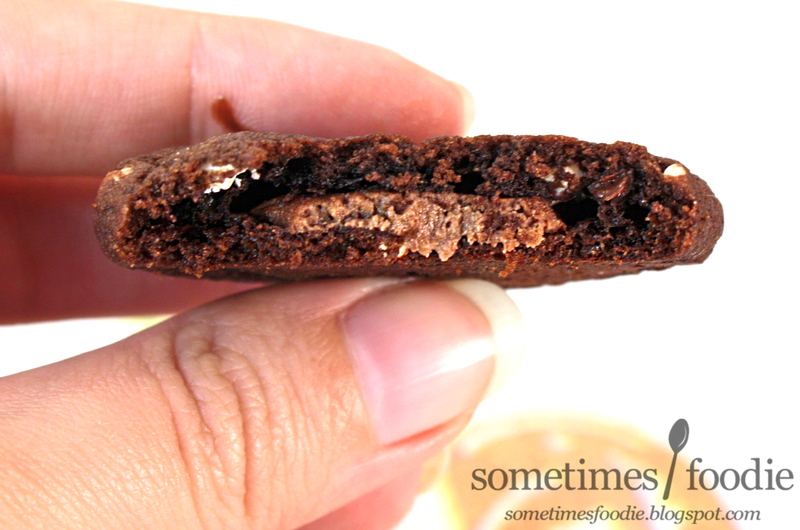 If you're looking for a chocolatey fix this winter, without doing any baking, this is it! If I wasn't so swamped with other food products to review, I'd buy another bag of these for the holidays. 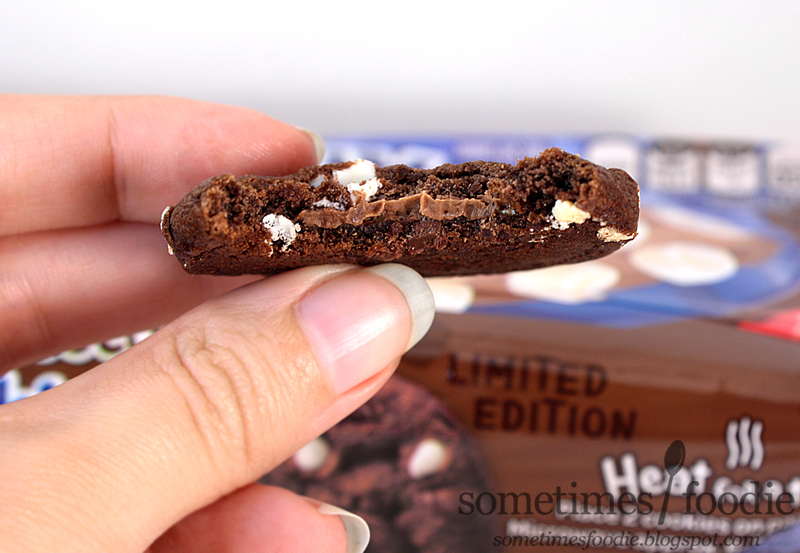 A better concept would be a marshmallow filling in the cookies!! !